Spices are a way of connecting with people and cultures from all over the world in a deeply universal way. Throughout the last millennia, the spice trade and the diaspora of traditional cuisines has tracked along with globalization, expanding beyond the places where they originated. Now, most of us are familiar with spices and flavors from all over the world. But, what if there was a way to honor and reconstruct those traditional flavors? 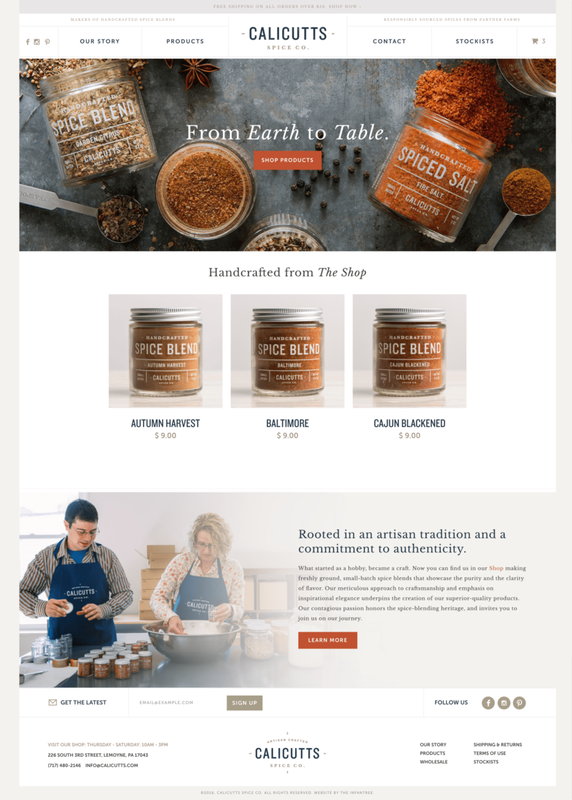 As spice artisans, Robert Orth and his business partner, Autum Ellis, came to us with a passion for crafting high-quality spice blends that you simply cannot find in a grocery store. The name for the brand was appropriately inspired by Calicut, a city in southeastern India which was known as the “city of spices” for its role in the spice trade between East and West. It’s only just south of where the famous Portuguese explorer Vasco de Gama landed in 1498. Robert and Autum had a product that people loved, an inspired, historically rooted brand story, and a bustling demand for product through their Etsy shop. But, they knew they needed to establish a clear and full brand identity and think through how to strategically communicate where they were heading. For the key piece of the brand's identity, our designers worked to create a logo that evokes a sense of adventure, exploration, and its historial inspiration. The wordmark includes a compass rose motif and typography that is inspired by early woodcut type fonts. The main focus of the wordmark is slightly distressed to evoke the weathered history of the brand, as if it was stamped on a crate just hoisted from a merchant’s ship. How do we communicate that value through the way the products look on a shelf, in a stockist's shop? 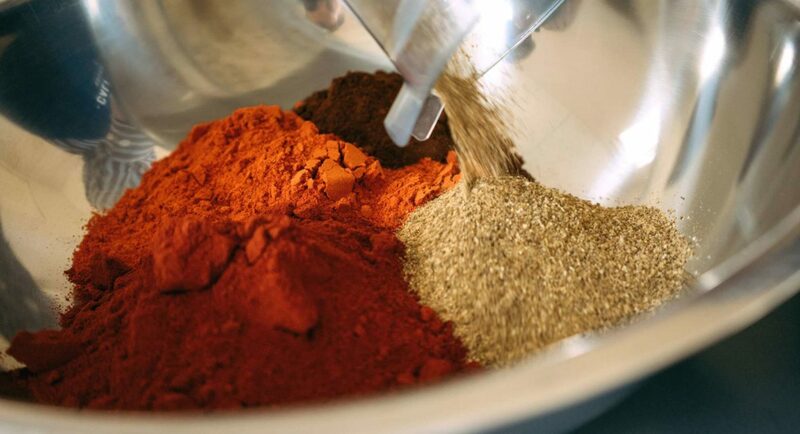 Calicutts’ blends are made from the highest quality ingredients, sourced from small, independent farmers from all over the world, and are hand toasted and hand ground. The packaging solution we created includes clear jars that highlight the natural color and texture of the natural ingredients, a label that is neutral, refined, and tastefully restrained, as well as brown boxes and muslin bags that can be stamped with the wordmark. 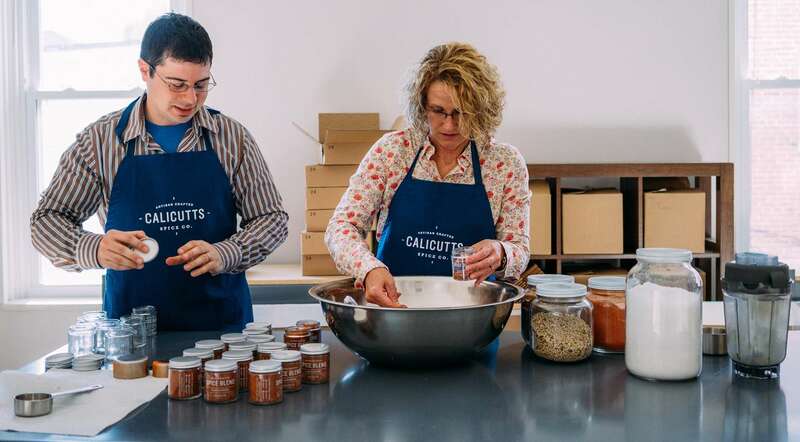 Now, after more than a year of operating under the new brand, Calicutts is poised to continue growing and inspiring new explorers to experience the flavors of the world. 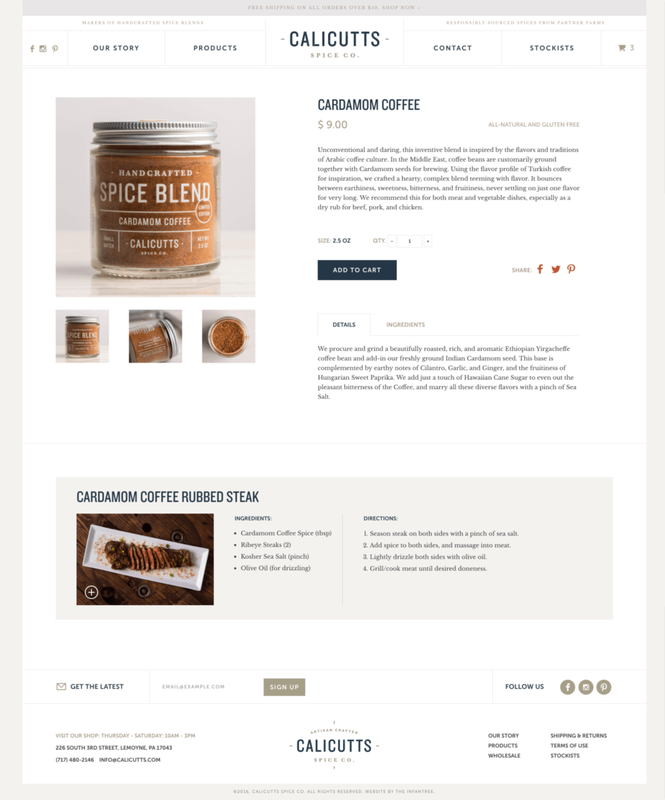 To help them do that, we recently worked with Robert to translate the brand onto the digital stage, with a full ecommerce website that will meet both wholesale and retail needs, while communicating the brand’s elegance, tradition, and artistry. We’re incredibly honored to help build and maintain the Calicutt’s brand, and we’re even more excited to see where the adventure will lead. Owner of Calicutt's Spice Co.